Here is a real example of how to add a column to a list in M3 using a Script for Smart Office. It’s an illustration of my previous post on the same subject, an implementation of what was discussed in the comments of the first post, and a continuation of Karin’s post. 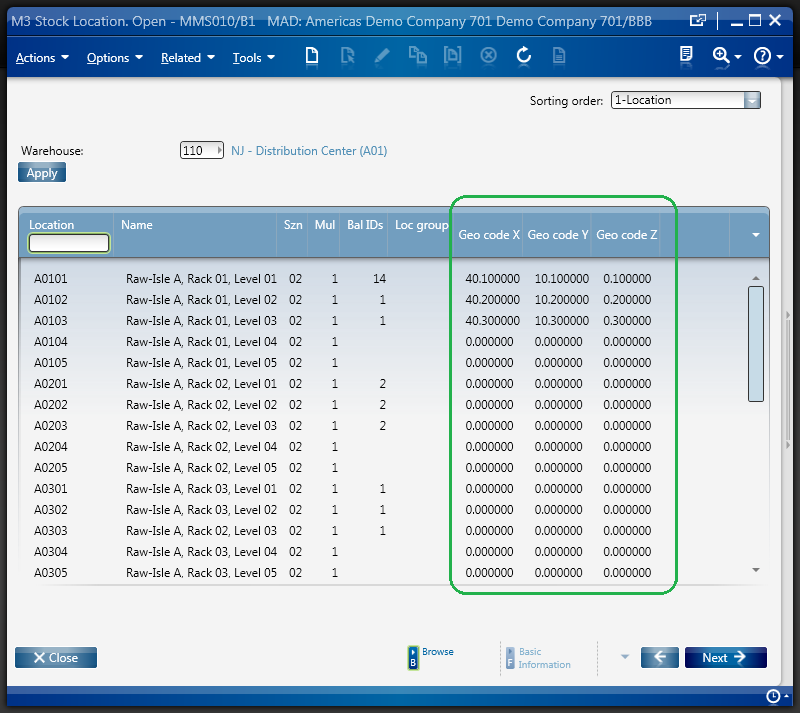 In this example I will add three columns to the list of Stock Location – MMS010/B1 to display the Geographic codes X, Y, and Z, which correspond to the longitude, latitude, and altitude of a Stock Location in a Warehouse. The Geo codes are stored in MMS010/F. The benefit of this kind of solutions is to avoid an M3 Java modification. 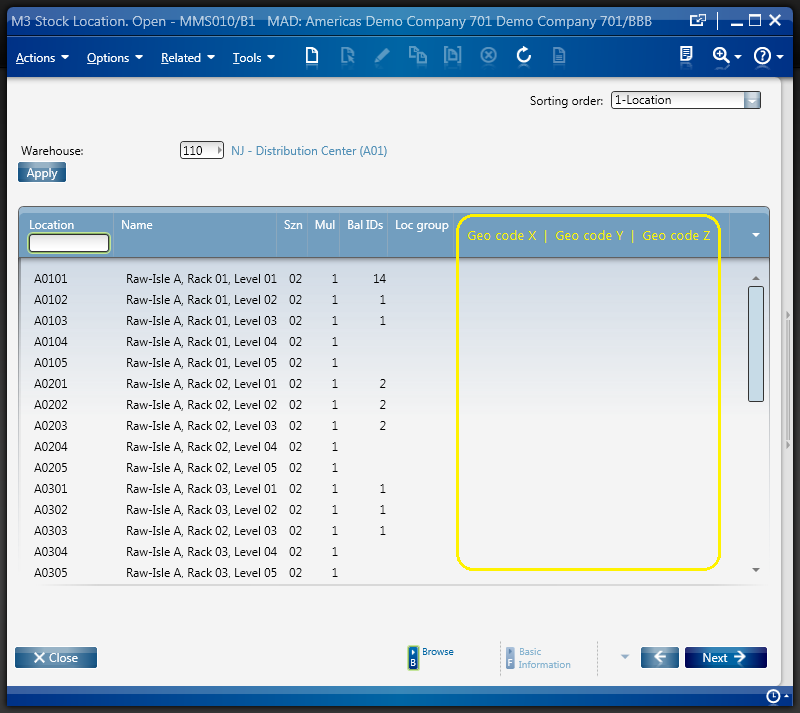 From a technical point of view, this example illustrates how to dynamically add content to an existing M3 panel, how to access the ListView’s new internals in Smart Office 10.x, how to call an M3 API, how to use a background thread, how to indicate activity in the UI thread while the background thread works, and how to use the ScrollViewer to load data at each page scroll. Displays the Geo codes XYZ in MMS010/B1 in three new columns loaded by calling MMS010MI.ListLocations. Loads the Geo codes XYZ by calling MMS010MI.ListLocations. Handles the response from MMS010MI.ListLocations. Loads more rows on ScrollViewer. Shows the Geo codes XYZ for the specified rows. Returns the Geo codes XYZ for the specified WHSL. This solution loads all records from the API call with MaxReturnedRecords=0. This could be a problem when there are more than several hundred records, or when the server/network response time is bad. I yet have to find a solution to improve this. Also, the user could scroll the page while the response of the API call hasn’t arrived yet. I yet have to improve the code for that. Finally, in my next article I will illustrate how to achieve the same result without programming, by using Custom Lists and Mashups. I updated the script to detach the event handlers on program close, i.e. cleanup. In all of the examples I have seen, columns are added to the list view but how feasible is to actually insert the new column in between existing ones? I need to insert a new column in OIS101 and this list view in CRS020 is already with the needed columns so I can’t just replace any of them. Could you please provide an example or feedback on this topic? Thanks very much for the valuable information. I follow the logic to work on PPS170 to tell users which proposal is for customer order and which one is for safety stock. The listView needs to be refreshed by calling listView.Items.Refresh() to have updated items displayed. I add a button for users to manually update it when they browse to next page instead of using ScrollChanged, which does not work. I also give users a feedback using MessageBox to tell them how many rows browsed and how many updated. Thanks for sharing your solution Warren. I have the same requirement. I have to update an editable cell when a user clicks a button and the value of that cell is blank. In the debug line I see the value being updated. However, in M3 even if I add the refresh the new values still doesn’t reflect. Please see my code below for the onClick method. P.S. I’ve also tried to move the refresh after the assign and out of the for loop. Still no luck. Glad you found the solution. Thank you for sharing. do you have a solution for it? I used your code in MMS010. data is not coming in grid as you shown in the final result. grid header is coming but data is not coming. what should i do? Jaju, you’ll have to debug your code line by line (comment all the lines and uncomment one by one, or use a lot of debug.WriteLine) to identify the variable that’s null. The numbers 0, 0, 3 and the structure is magic for me. I tried to do simillar script, in script tool is everything working, in the script put to personalization this part does not work, is there a way, how to find the tree structure of page and how to get to the scrollViewer for which I need to attach event handler? Yes, the constant numbers will break if the visual tree changes in Smart Office. Hi! Did you ever find a way to align the column content (not the header) to the right? Haven’t been able to find a way to do this myself.